The amount of stick injuries I’ve seen has convinced me that people can provide safer playtime options for their pets. Does your dog play with sticks? Dogs and sticks go together like … well, cats and string. It’s hard to pull a dog away from a good game of finding and retrieving a thrown stick. Veterinarians warn you not to throw sticks for your dog, so does this mean vets just don’t want your dog to have fun? Not at all. By way of a cautionary tale of how sticks pose a very real danger to dogs, here are a couple of real-life cases seen at my clinic. One morning I happened to follow a Staffie-cross named Tessy into the clinic. She looked sore, walking with a hunched back and moving as if every bone in her body hurt. In the exam room, Tessy was feeling as terrible as she looked on the street, and she was running a fever. Tessy’s symptoms were strange and didn’t quite fit with my first impression of a slipped disc. I ran blood tests, and she had some weird shifts in her white cell count — which made meningitis a possibility. The more I investigated, the weirder the picture became. Long story short, we decided to refer Tessy to see a specialist for an MRI scan of her spine. A 6-inch long stick had migrated out of the dog’s gut (she had chewed and swallowed it) to lodge alongside her spine. The stick had created a large abscess (a pocket of pus), which was now bathing her spinal cord in poison. Several hours of surgery later, and Tessy came out of the operation with a guarded prognosis. Everything possible had been done, and now it was a waiting game to see if she would make it or not. Happily, she went on to make a full recovery but racked up a substantial bill in the process — and all because of chewing a stick. How could one stick do so much damage? Tessy had chewed and swallowed it. The contractions of her gut had pushed the sharp end through the bowel wall, where it had migrated up to her spine and lodged there. This second case is more typical of a stick injury: impalement. Yes, it is as horrific as it sounds. Have you ever watched a stick in flight and seen it cartwheel through the air? When it hits the ground it can continue to spin, and some dogs running at full throttle can run onto the end of the stick and impale themselves. Beanie, a Border Collie, did just this. Caught up in the thrill of the chase, she fully ran onto the end of the stick where it pierced her body. Her family rushed her straight to the veterinarian. The bizarre thing? The only part of the stick visible was a stubby end poking out from under her tongue. We went ahead and gave Beanie an anesthetic to investigate. The stick was huge! It had entered under Beanie’s tongue and pushed all the way down her neck to reach the entrance to her chest. Very carefully, we pulled out the stick, which just kept on coming. Beanie was incredibly lucky, and with a course of antibiotics and pain relief, she made a full recovery. Many dogs aren’t so lucky (if you can call Tessy’s and Beanie’s injuries good luck). I can also think of an elderly Weimaraner who presented with marked weight loss and foul breath. The family was convinced their dog had kidney failure. 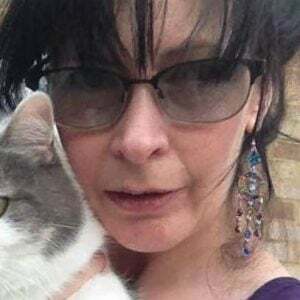 But a physical exam showed a stick wedged between the back teeth that had stopped the dog from eating and caused a deep, infected sore on the inside of the cheek. Not pleasant, granted, but a much better outlook than kidney failure. In short, a stick and a dog in full flight are a recipe for disaster. Even sticks that aren’t moving aren’t much better. I’ve lost track of the injuries to dog’s mouths I’ve treated where the stick splinters and embeds in the gum or between teeth. 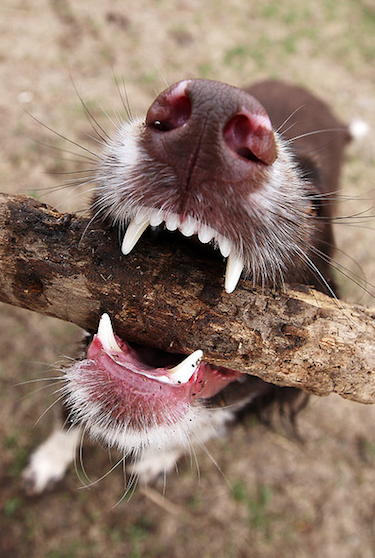 Retrobulbar abscess (an abscess in the socket behind the eye) can happen in dogs who chew on sticks, though it’s rare. A dog enters my hospital with a retrobulbar abscess (an abscess in the socket behind the eye) about once a month. It also occurs in cats but very rarely. 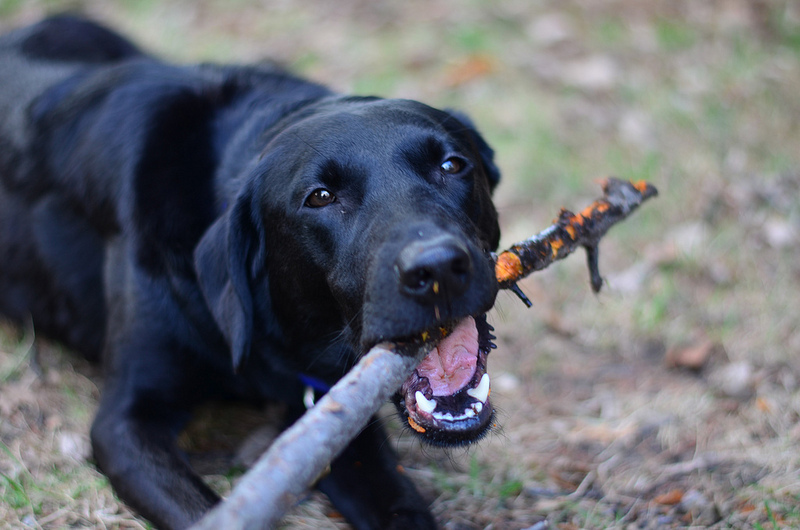 Dogs like to chew things, like sticks and plant material and all kinds of good stuff out there. How cute when Chomper is holding that brittle, dry stick between his front paws and chewing away at it, back of stick wedged nicely up in the corner of his mouth. And you’re happy because he’s leaving you alone, just whittling away, using his back molars as a paring knife. And then a little piece of that stick breaks off just up behind his last tooth. It’s so dry that it’s easy to migrate, like a little nomad splinter, up through the roof of his mouth and fester, in that space above the roof of his mouth and behind his eyeball. And it stays there, causing no problems, for a few days. Then, Chomper tries to yawn or open wide and he cries. You try to look in his mouth, and he cries louder. He screams and won’t let you open his mouth. It’s time to call the vet. These infections can occur from other trauma, tooth infections, etc., but most of my cases occur in ardent stick chewers. Even chewing on some dried up old weeds or plant material can do it. Just think about how annoying it is for you if you get a little something caught behind a tooth requiring the emergency dental floss. Well, a dog is unable to tell you he needs to floss. A classic telltale sign of a retrobulbar abscess is a slightly swollen or protruding eye. Maybe the third eyelid is protruding too. But these symptoms can be very subtle. Most of the time, the dog is unwilling to eat, “afraid” of his food or, as I said, crying when he tries to open his mouth. Oral antibiotics, topical ophthalmic antibiotics and pain medications are the first line of treatment. But these abscesses often require a short procedure, under anesthesia, to surgically open up the area on the top of the mouth, behind the last molar. This enables that retrobulbar area to drain so the infection can be cleared up. These are painful, and there’s nothing you can do at home except pick up the phone and make a veterinary appointment. Remember this: If an eye “looks funny,” see a vet. This goes for all pets. Eye problems are not something you can fix at home. 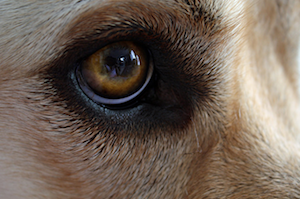 Most eye issues get worse quickly without veterinary intervention. Not to be too dramatic, but what might just look like a slightly swollen eye or a hazy eye could mean loss of vision without quick attention. Just this week, I did a follow-up exam on a dog that had had an acute episode of bleeding into the eye. This was caused by very high blood pressure. Without emergency treatment, the dog would have lost vision and been at great risk because of the hypertension. She is doing very well on high blood pressure and eye medications. Her incredibly attuned owner saved her eye by getting this little Dachshund to the ophthalmologist immediately. Well, here’s my take on this very important and needed specialty: Ophthalmologists are worth it. When I mention a second opinion or a referral to a specialist, many of my clients think of one thing: money. Specialist = expensive, in their minds. While it’s true that there is a price tag associated with a specialist, ophthalmologists are invaluable if your pet has an involved eye problem. Retrobulbar abscesses are not generally in this category. They can usually be managed by your general veterinarian. But what about the bulging eye that isn’t improving? Or the hazy eye with the ocular bleed? Without special equipment and special knowledge, the root of the problem sometimes can’t be diagnosed or treated appropriately. If a veterinarian is boarded in ophthalmology, he or she has completed 4 years of veterinary school, an internship, a residency in ophthalmology and then passed the ophthalmology boards. These specialists have much of the same high-tech equipment and skills that human eye specialists have. These instruments are needed for many involved diagnoses. The human field has come miles in treating eyes, and much of that knowledge is now being used in the veterinary field. Veterinary ophthalmologists are making early diagnoses, performing involved cataract surgeries and other procedures, and saving eyes and sight that would have been lost in years past. If your vet is urging you to have your pet’s eyes seen by a specialist, heed the advice and go sooner rather than later. You may save an eye, save vision and, as with all earlier intervention, maybe save some veterinary bills in the long run. If you have big concerns about the expense of a visit to an ophthalmologist or specialist, this is what I tell my clients: Go for the consult and get the valued opinion. 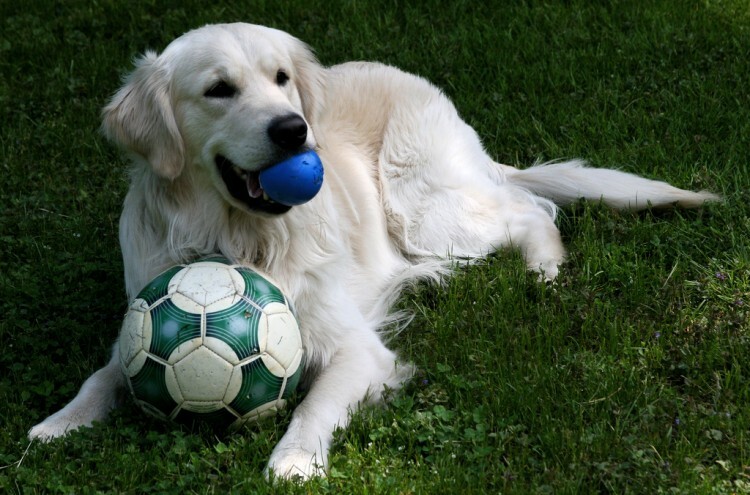 You may be able to return for follow-ups with your regular vet, who can manage the treatment plan and the medications. But with difficult cases, having the diagnosis pinned down and the state-of-the-art treatment delineated by a specialist is worth its weight in gold. Remember: Veterinarians are not killjoys — they’ve just seen things that make your toes curl. Let your dog enjoy the thrill of the chase, just not with a stick. There are safer options available. This pet health content was written by a veterinarian, Dr. Pippa Elliott, BVMS, MRCVS, with contributions from Dr. Debora Lichtenberg, VMD. It was reviewed for accuracy by Dr. Elliott and was last updated Dec. 17, 2018.